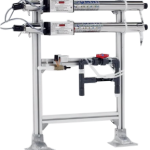 OMNI Solutions provides innovative laundry cleaning solutions and technologies to healthcare, hospitality and commercial institutions. OMNI’s energy efficient products help on-premise and commercial businesses produce the cleanest, most hygienic laundry possible. The Omni Solutions portfolio includes the Smart Ultraviolet Light Advanced Oxidation System (SULAOS), LUX Hydroxyl System, Smart Laundry Products and Smart Housekeeping Concentrate Products. Using Earth-friendly, biodegradable cleaning solutions, OMNI Solutions’ programs are designed to help laundries achieve high levels of cleanliness, decrease impact to the environment and cut operational costs. 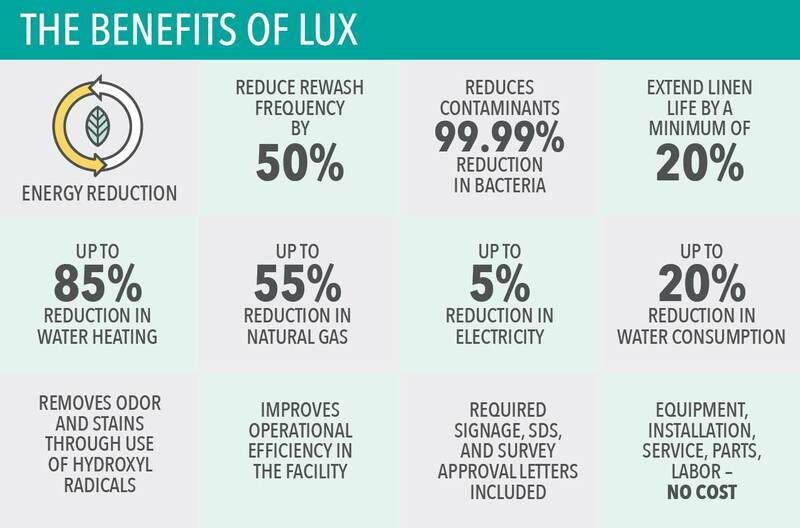 OMNI Solutions’ LUX Hydroxyl System provides outstanding cleaning and disinfection, while significantly lowering utility costs. The LUX technology supercharges in-house laundry systems through Hydroxyl radicals. Hydroxyls are more stable at lower temperatures, reducing the need for hot water by 85%, or in some cases, eliminating the heating of laundry water altogether. The LUX Hydroxyl system is designed to work in tandem with OMNI Solutions biodegradable laundry products, working best in cooler water temperatures, reducing energy consumption, lowering utility costs, and resulting in significant sanitation and disinfection efficacy. Pentagon: Total Annual Savings: Water: 376,680 gallons & $3,766.80; Gas: 20,627.22 therms & $24,752.67; Electrical: 5.317.32 KwH & $372.21; Linen: $2,250.00. Golden Living Heathcare Three Oaks: Water: 289,080 gallons & $2,312.64; Gas: 12,797.81 therms & $9,598.36; Electrical: 53,425.16KwH & $239.76; Linen: $1,125.00. Kalahari Resorts, PA: Total Savings: Water: 447,760 gallons & $4,467.70; Gas: 24,845.76 therms & $29,814.92; Electrical: 5,495.44 KwH & $384.68; Linen: $2,250.00. The industry leader in providing laundry sanitization and energy saving technologies to healthcare, hospitality and commercial institutions, OMNI Solutions believes that supporting clean water initiatives goes to the core of our business purpose. OMNI Gives is a registered 501(c)(3) non-profit organization whose mission is to provide funding for charities bringing clean and safe drinking water to areas in need.